The now-fired national security adviser's attorney told transition team attorneys about the potential filing before the inauguration. "Was the president aware that Lt. Gen. Michael Flynn was acting as a foreign agent when he appointed him to be the national security adviser?" Fox News correspondent John Roberts asked White House press secretary Sean Spicer at a press briefing Thursday. 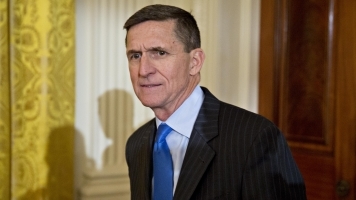 But a report published by the Associated Press on Friday says Trump transition attorneys, including now-White House counsel Don McGahn, did know Flynn "might need to register with the government." Flynn ended up filing his paperwork on Tuesday. It was for $530,000 worth of lobbying work he and his now-shuttered firm did during the presidential campaign for a Netherlands-based company. According to the filings, the work "could be construed to have principally benefited the Republic of Turkey." The AP reports Flynn's attorney told transition lawyers about the potential filing before the inauguration. "I don't think that it should be a shock to anybody that if you're asked a government lawyer what you should do in your private capacity as a citizen, they're going to tell you you should consult experts in that area to determine what you should or should not do," Spicer said Friday when asked about the report. Spicer said during Friday's briefing that President Trump didn't know Flynn might need to register as a foreign agent. But news of Flynn's lobbying work was reported in November. "Can you say that the president was informed at all about the arrangement and the need to register as a foreign agent?" a reporter asked. "Did this set off any alarm bells with any other —" the reporter followed up. "No," Spicer said. "Just so we're clear, Gen. Flynn filed with the Department of Justice two days ago. How would anybody know? That's sort of like asking —"
"What about the need to file?" "That's up to his personal lawyer," Spicer replied. "You have an attorney calling the transition saying that the person who is in line to be the national security adviser may need to register as a foreign agent. And that doesn't raise a red flag?" Roberts of Fox News asked. Spicer responded, "No. It's not a question of raising a red flag, John. It's a question of whether or not they gave them the advice they're supposed to." "Forget about filling out forms and the legalisms here — what does this say about the transition team's judgment about still appointing him as national security adviser when you had knowledge of this information?" Glenn Thrush of The New York Times asked. Spicer responded, "You're asking me, 'forget about the legalisms.' That's what we ask people to do, is follow the law." Thrush later asked, "We're talking about the judgment — the judgment that the president, the vice president and your team made to select this man as national security adviser when you had information that he had these dealings with Turkey. Why did you guys still make that decision?" Spicer responded,"What dealings are you referring to? The fact that he had a client — he was also the head of the defense intelligence agency. Unbelievably qualified — 40 years in the military with impeccable credentials. So what is it? That he — what is, exactly, are you getting at?" NBC's Peter Alexander later asked, "Does this raise concerns that there may be other members of this administration or other members that served in the transition that were or are currently lobbying on behalf of foreign governments right now that may be advising the president of the United States?" Spicer responded, "We trust people to fill out the appropriate forms that they need to. ... This president, when it comes to ethics, when it comes to lobbying, he instituted a 5-year ban. ... He has has been very committed to making sure we institute high standards here, and we're held to them."